Info: [ Kirti monks in exile ] Approaching the government office, he poured petrol on himself and started shouting the slogans, then set fire to himself as he reached the entrance. He continued repeating them many times over before he died. 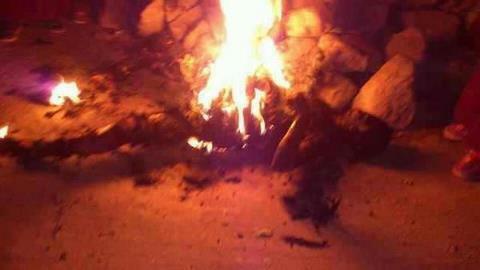 Kelsang Kyab sets himself on fire today, November 27, 2012 at 7 PM in Kyangtsa township, Amdo Dzoge, Ngaba district. Monks say prayers over the charred remains of Kalsang Kyab in Dzoege, Nov. 27, 2012. 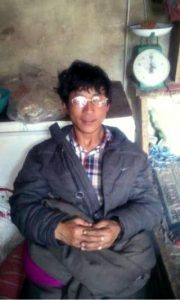 In the latest self-immolation protest in Sichuan's Ngaba (Aba) prefecture, a Tibetan man, Kalsang Kyab, burned himself to death on Tuesday in front of the local government office in Kyangtsa town in Dzoege (Ruo'ergai) county, shouting slogans against Chinese rule and hailing the Dalai Lama. It brought the total number of self-immolations to 86 since the wave of fiery protests began in February 2009. Kalsang Kyab, 24, self-immolated near the local Kyangtsa government office, shouting, among other slogans, "Long Live the Dalai Lama," according to Dharamsala-based exile monks Kanyag Tsering and Lobsang Yeshi. "Before approaching the doorsteps of the local government office, he first doused his body with kerosene and shouted slogans. As he arrived near the door of the government office, he lit the fire and even after that he continued to shout several slogans," they said. A few days earlier, Kalsang Kyab had told some people that he had planned to self-immolate but none of them took it seriously, they said. In the testament, received by the exile base of Kirti Monastery in Dharamshala, Kalsang Kyab further expresses his wish for the “sun of happiness” to shine on Tibet. “Greetings to my dear brothers and sisters, and especially my parents, the kindest of all in this world. I am setting myself on fire for the sake of Tibet. The long life of His Holiness the Dalai Lama must be assured. It is my wish that the sun of happiness may shine on the land of Tibet,” the testament reads. Kalsang Kyab, 24, set himself ablaze in front of a Chinese government office in Kyangtsa town in Dzoege region of Ngaba, raising slogans for the long life of His Holiness the Dalai Lama and Kyabje Kirti Rinpoche, the exiled head of Kirti Monastery on November 27. He passed away at the site of his protest. Later that night, at around 10 pm, more than 40 monks from Taktsang Lhamo Kirti monastery came to the deceased’s home to perform prayers of dedication, according to Kirti Monastery. Yesterday, over 1000 local people, mainly from the Goe Shoka area where Kalsang Kyab lived, came to pay their last respects and express solidarity with his bereaved family members. Citing sources in the region, Kirti Monastery further said that around 200 Armed Police and Public Security officers were deployed in Goe Shoka and an Armed Police truck has been stationed on the mountaintop overlooking the village. Internet services in the area have also been suspended following the self-immolation, a tactic regularly employed by Chinese authorities to curb the flow of information. Kirti Monastery also released pictures of the three monks, Dorjee, 15, Samdup, 16, and Dorjee Kyab, 16 of the Ngoshul Monastery in Ngaba, who set themselves on fire in front of a local Chinese police station on November 7. Dorjee, 15, passed away at the site of the protest, while the condition and whereabouts of the two other monks remain unknown after they were taken away by Chinese security personnel.